SAN JOSE, March 16 — Because the American Automobile Association throws numerous safeguards about racing the twenty-five-mile event on the program of automobile races to be given at San Jose Driving Park, Sunday afternoon will be run in heats. There are ten entries in this event and five machines will start in each of two heats. There will be six in the finals, the first three to finish in each heat qualifying. The entries included R. Jeffkins, the Australian, who will drive a Buick for the Howard Automobile Company of San Francisco; Earl Cooper of San Francisco in a Stutz; Emile Agraz of San Jose, Maxwell; Earl Devore, San Francisco, Buick; Ray Cooper, San Francisco, Comet; A W Buehren, San Jose, Sunset; D H Ross, San Jose, Comet; Charles B Weldrick, San Francisco, Mitchell Six; A C Handy, Indianapolis, Velle; T D Orr, Sacramento, Pope-Hartford. There will be a five-mile event, a ten-mile, two match races and a mile record trial, in which all cars will enter. Devore is Star in Small Car Events, While Cooper Wins the Marathon Houors. SAN JOSE, March 17 — Earl Devore. 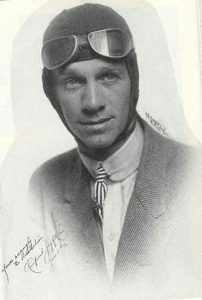 in a Buick, carried off the honors in the small-car events at the St. Patrick’s day auto race meet here today, while the Stutz with Earl Cooper as pilot, won the twenty-five-mile-free-for-all and the three-cornered match race, the feature event of the day. R. Jeffkins, the Australian driver made the fastest mile for the Merhid trophy, negotiating the distance in 0:551/2, establishing a new record for the track, a flat dirt saucer. A general fistfight at the end of the twenty-five-mile event, in which Emile Agraz, the promoter and one of the drivers, struck at Jeffkins and bruised the nose of T.F.Holmes. the A.A.A. referee, marked the end of the day?s racing. Agraz accused Jeffkins of running into his Maxwell during the race. The largest crowd which ever attended a race meet here was present. Manager D.W.McElligott of the Halliwell Company’s local branch was busy yesterday receiving congratulations on the good work of his Right Oil at San Jose, Sunday. This was the lubricant used by Jeffkins on the Buick which covered one mile in 0:551/2, which was the fastest mile of the day and a remarkably speedy time. The Halliwell Company has but recently taken on the distribution of the Right Oil and it is their plan to press it into favour of the local motorists. Webmasters Note 2: The Howard Automobile Co., Golden Gate Ave, San Francisco, who Rupert Jeffkins drove for, was certainly a major dealer for Buick in 1912. The advertisment below (which is of poor quality and hard to read) appeared in the San Francisco Chronicle, March 17, 1912. It claims “This third shipment of Buick cars is even larger than either of our two former trainload shipments, each of which held the world’s record in turn. First 224 cars, second, 228 cars and third 250 cars. That’s a total of 702 Buick automobiles, valued at $729,220, shipped to us within 60 days, sight draft against bill of loading.” Wow!! This web site is a non-commercial, official publication of The Buick Car Club of Australia Inc. in N.S.W. The contents of the site are the copyright © of The Buick Car Club of Australia Inc. in N.S.W or the copyright © of the contributor and included in this site with their permission. Approval to reprint, in part or whole, may be granted with written permission of The Buick Car Club of Australia Inc. in N.S.W. The contents of this site should not be relied upon as documentation in areas of vehicle authenticity or technical information. Whilst club members are always willing to assist a fellow enthusiast, users of this site are advised to rely upon their own enquiries.